Not to be confused with Kirkandrews. 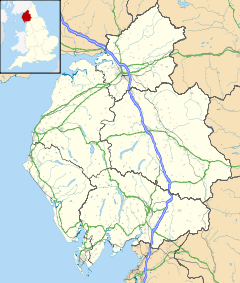 Kirkandrews-on-Eden or Kirkandrews-upon-Eden, in the past known as Kirkanders, is a village and former civil parish, now in the civil parish of Beaumont, in the Carlisle District of the county of Cumbria, England. The village is found 4 miles North-West of Carlisle. Kirkandrews forms part of the Barony of Burgh together with the nearby villages Monkhill, Grinsdale, Rattlingate and Burgh-by-Sands. The civil parish was merged into Beaumont in 1934. In 1931 the civil parish had a population of 145. Hadrian's Wall Path and the Vallum run through the village. The village is 500m from the River Eden along which the Cumbrian Coastal Walk runs. It contains several examples of interesting listed buildings, Hollow Creek Farm, built in 1760, The Manor House, The Croft and The Beeches, Beech House are Grade II listed. National Cycle Network Route 72, Hadrian's Cycleway, stretches 160 miles along the Hadrian's Wall World Heritage Site from Ravenglass on the Cumbrian coast via Kirkandrews-on-Eden to Tynemouth near Newcastle upon Tyne. The Church of St. Andrew, which formerly stood here and gave a name to the village, disappeared long ago, and nothing now remains to point out its site, save the undulations of the greensward and the well of St. Andrew found in the old graveyard. Since the year 1692, Kirkandrews has been united with Beaumont in all ecclesiastical matters, and St. Mary's Church at Beaumont and Beaumont Parish Hall in Kirkandrews serve for both parishes. Evidence of the Carlisle to Port Carlisle Canal, later converted to the Carlisle to Silloth Railway are to be found in the village and surrounding fields. Kirkandrews railway station was a victim of the 1964 Beeching cuts. ^ "Relationships and changes Kirkandrews upon Eden AP/CP through time". Vision of Britain. Retrieved 9 February 2018. ^ "Population Statistics Kirkandrews upon Eden AP/CP through time". Vision of Britain. Retrieved 9 February 2018. Wikimedia Commons has media related to Kirkandrews-on-Eden. This page was last edited on 28 February 2018, at 17:41 (UTC).